Send a message to a former Thieves Guild client. Burning beehives at Goldenglow Estate. (Optional) Enter using the sewer. (Optional) Obtain the key to Aringoth's safe. Retrieve the Goldenglow Bill of Sale. Once Mercer has allowed you into the Guild, he'll challenge you with a new job. Goldenglow Estate was once the Guild's sweetest deal. The Guild made sure that the honey flowed constantly to Maven Black-Briar's meadery by keeping the workforce in line and scaring off potential competitors. In return it was allowed to extort huge sums of money from Aringoth, the owner. However, the shipments have suddenly ceased and when Vex was sent to investigate she found an army of mercenaries. Maven isn't pleased and it's your job to teach Aringoth a lesson by burning down three bee hives and clearing out his safe. Before leaving, pay Vex a visit and she will tell you about a secret sewer entrance on the northwest side which will make it significantly easier to enter unseen. Your first objective is to burn the beehives, which you can reach in two ways. The simplest route is to wade ashore on the northernmost island, dispatch the numerous mercenaries protecting the estate and then burn the hives. A stealthier solution is to wait until dusk, swim to the rocky outcrop to the west of the beehives and then clamber ashore, hidden by a small wooden wall. To set the beehives on fire you can use a torch, the Fire Breath Shout, or a fire-based spell; simply standing next to a hive with a torch or spell equipped will suffice. A rapid execution is important as three mercenaries will come rushing to investigate, so quickly burn the three southernmost beehives and then retreat behind the wall. Jump back into the lake and circle around to the northern island. Be careful not to burn more than three beehives, or you will forfeit your gold reward. Wade ashore underneath the wooden platform on the northwestern end of the island and dive into the sewer grate nearby. 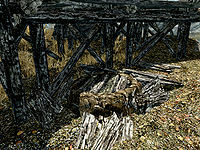 The sewer is only inhabited by a few skeevers, three of which can be taken out by using an oil slick and some fire. About half-way through is an adept-lock cell where you'll find the Pickpocket skill book Guide to Better Thieving. After leaving that room continue down the corridor and you will find a ladder back to the surface. Climb it and you will resurface next to the back entrance of the estate, which has an expert level lock and lands you in a more favorable location than the front door. Alternatively, you can sneak your way to the front door, which is unlocked, or take out the mercenaries and enter through either door. Inside the estate you will find numerous mercenaries which you can either kill or sneak around. You should eventually arrive at a corridor patrolled by a mercenary while two more sit at a table. Avoid them by sneaking into the nearby dining room and you'll find yourself in front of a gate leading to the basement and a ladder leading to the second floor. Heading upstairs will earn you more loot and you'll be able to take the safe's key off Aringoth. The first mercenary can be avoided by slipping into a room on the left, traversing it and then moving down the corridor hugging the wall and using a wardrobe to screen you. 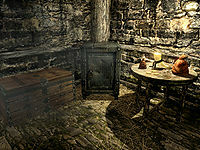 In the last room, slowly sneak behind the back of a mercenary sitting at a table and pick open the door. Here you will find Aringoth and you can retrieve the safe key by either pickpocketing him, killing him or persuading him to hand it over. You must pass a hard-level Speech check to persuade Aringoth and, if you fail, he will attack you, alerting the nearby mercenary. 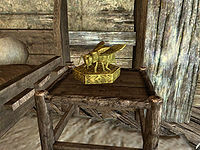 There is also a Queen Bee statue on the nightstand next to the bed which can be sold to Delvin. Whether or not you have the key, unlock the metal gate once the mercenary patrolling the corridor has turned around and enter the basement. Sneak past or dispose of two mercenaries in the first room. Using a spell to set fire to the oil puddle leading up to his chair can aid you with dispatching the last mercenary. If you wish to remain undetected, sneak to the dark corner behind him, shoot an arrow down the corridor and slip away when he charges off to investigate. Alternatively, invisibility or the dragon shout Throw Voice will also work. Pick the safe or open it with its key and retrieve the Goldenglow Bill of Sale and some gold. Before you leave, loot the nearby chest and scoop up some gold purses. A gate will lead you back into the sewers, so exit them and swim away to the shore. Head back to the guild and talk to Brynjolf. As long as you've completed the job to the letter, he'll be very pleased and reward you with a leveled amount of gold, as detailed below. He'll also point you to Maven Black-Briar, who has requested you for a special job. 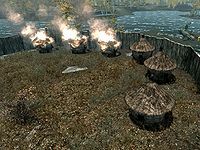 After speaking with Mercer, three Thief Cache barrels will appear around Riften. Sometimes when trying to burn the hives at Goldenglow Estate with a torch or a single-shot fire spell (like Firebolt and Fireball), the hive won't catch on fire the first time and may require that you hit it multiple times before it starts to burn. This may cause Brynjolf to act as if you had burned more than three hives, however, and result in your not getting paid even though you only burned three. To avoid this, try using the Flames spell as it seems to work more effectively. 10 Brynjolf is taking me to meet the leader of the organization he represents. He says more work and significantly more coin could be available if I join their ranks. 20 Thanks to Brynjolf's support, I've been welcomed into the Thieves Guild by its Guild Master, Mercer Frey. I'm eager to receive my first task and prove that his recommendation wasn't in vain. 30 My first task as a member of the Thieves Guild involves a honey operation located just outside of Riften called Goldenglow Estate. My actions there are in direct response to the owner's sudden silence and lack of cooperation with the Thieves Guild and Maven-Black-Briar, one of the Guild's most important clients. 200 Finishes quest I've completed my task at Goldenglow Estate and discovered the owner's sudden lack of cooperation with the Guild was leveraged by an anonymous buyer of that very same location. Why this buyer purchased Goldenglow and is showing animosity towards the Guild is a mystery for the moment. The following empty quest stages were omitted from the table: 0, 15, 35. On the PC, it is possible to use the console to advance through the quest by entering setstage TG02 stage, where stage is the number of the stage you wish to complete. It is not possible to un-complete (i.e. go back) quest stages, but it is possible to clear all stages of the quest using resetquest TG02. This page was last modified on 22 March 2019, at 14:10.